Wales will be without Aaron Ramsey for Tuesday's Nations League clash against the Republic of Ireland in Dublin because of family reasons. The 27-year-old midfielder did link up with Ryan Giggs' squad for the 4-1 international friendly defeat against Spain in Cardiff on Thursday, where he picked up his 56th cap and was captain in the second half. 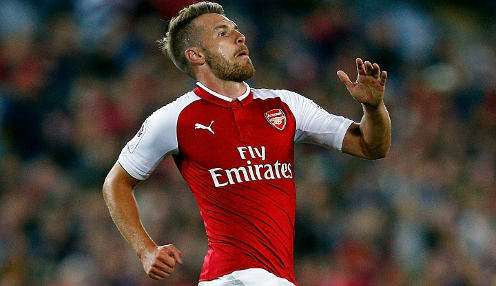 However, Ramsey will play no part against the Irish because of personal reasons with Arsenal previously allowing him to miss their Europa League away game against Qarabag earlier this month so he could stay at home with his pregnant wife. Bournemouth's David Brooks is likely to be the man who will come into the starting XI to replace Ramsey, while Swansea City's Daniel James has been drafted into the senior squad from Wales' U21s set-up. The news of Ramsey's withdrawal will be a big blow to Giggs given that talisman Gareth Bale is already out of the game because of a groin injury. Wales are 14/5 to emulate their win against the Irish in the opening Nations League Group B4 clash last month, while Martin O'Neill's men are 7/5 to exact revenge with the draw available at 15/8.